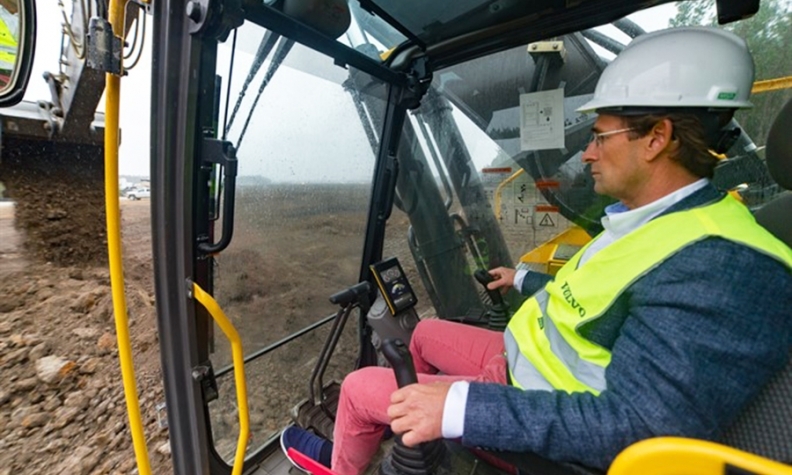 Volvo Cars of North America CEO Lex Kerssemakers officially broke ground on Volvo Cars' first American factory in Berkeley County, South Carolina, in 2015. STOCKHOLM -- Volvo Cars is doubling investment in its first U.S. plant, which is under construction, to add a second production line at a total cost of $1 billion, a source with knowledge of the plans told Reuters, as the carmaker heads for a fourth straight year of record sales. The move to raise capacity even before completion of the plant in Charleston, South Carolina, will ultimately add 2,500 workers to the 2,000 already being recruited by the carmaker ahead of its 2018 opening, the source said. A Volvo spokeswoman declined to comment. The increased investment was first reported by Charleston's Post and Courier newspaper. The plant is slated to produce the redesigned S60 sedan, with Job One moving next summer. A second vehicle still to be announced, the report said. The newspaper also reported that a press conference is set for Sept. 25 to announce the expanded project. Officials declined further comment. The second line will call for a $500 million investment on the site near Interstate 26 in Ridgeville, South Carolina. The newspaper said Volvo plans to build roughly 60,000 cars per year -- about 60 percent for export. The Berkeley County Council on Monday agreed to $3.5 million in economic incentives for the project, the newspaper reported. The Charleston plant expansion is a vote of confidence in Volvo's sales momentum, buoyed by a revamped lineup led by the flagship XC90 crossover, even as U.S. auto market growth tails off. Under the ownership of Chinese carmaker Geely's parent company, Zhejiang Geely Holding Group, Volvo has recovered from a sales slump in its final years under previous owner Ford and is now challenging larger premium rivals such as BMW Group and Mercedes-Benz. The company, one of Sweden's largest by revenue, has blamed supply shortages for a 7 percent dip in U.S. deliveries so far this year and vowed to achieve year-on-year sales growth for 2017 as a whole, along with a new global record.